Unless you watch SportsCenter pretty religiously, you probably had no clue that the NASCAR Sprint Cup Series season came to a close over a week ago. 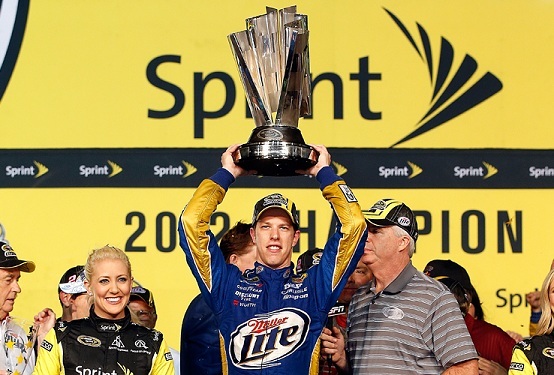 In which case, you also weren't aware that they crowned a new champion -- and his name is Brad Keselowski. Don't feel bad, not too many people recognize the name. It isn't a household one like Dale Earnhardt Jr., Jimmie Johnson, Jeff Gordon, or Tony Stewart. Keselowski won the Sprint Cup title in only his 3rd full season racing in the Series. His 125 career starts before clinching his first championship are the fewest starts needed since Jeff Gordon (93) back in 1995. The 28-year-old Michigander's stock is certainly on the rise, and deservedly so. Besides being a fantastic driver, Brad is also known for his presence on Twitter. He can often be found on the social media website interacting with fans. And that's just what NASCAR needs. After all, it hasn't been popular since, well, ever. Sure, there were the days of Bill Elliott, Dale Earnhardt Sr., and Richard Petty, but never has the sport been able to compete with the other major sports. It's just too difficult to hold someone's attention by simply having cars drive in a big circle for 200-plus laps. There isn't much excitement in that. Sadly, the only time people seem to be entertained is when there is a collision. Or of course, when there's drama involved. Like the post-race brawl between Jeff Gordon and Clint Bowyer's crews at Phoenix the week before the Chase finale, for example. I can understand being at the track is a completely different animal. The adrenaline rush and the vibrations from over 750 horses roaring by must be exhilarating. But you can't get that sensation from watching on TV. Don't get me wrong, the "Crank It Up" segments on Fox are pretty cool and all, but nothing compared to witnessing a race in person. Which is why it is important for NASCAR to find more drivers with personality like Keselowski to draw in more of an audience. Storylines alone only last so long. The Danica Patrick experiment has failed substantially. The first woman driver in the Cup Series since 1976 was an attractive story, but short lived. She hasn't finished better than 4th at any point, and ends up involved in wrecks more often than not. Instead, the man in the No. 2 Miller Lite Dodge has all the tools to make a lasting impact and put NASCAR on his back. Along with his competitive nature, Keselowski is free spirited and not afraid to speak his mind. He's not a cliche-slinging, sugar-coating robot of an athlete. As seen in his post-race interview at Phoenix, the guy has no problem dropping some four-letter words. That's just the passion Brad has, and that's the type of passion NASCAR needs.